BOCA Original Chik'n Vegan Patties are tasty and extremely easy to make. These breaded patties are delicious in sandwiches. These soy burgers provide 11 grams of protein per serving while containing 130 calories each. Made from 100% vegan ingredients, these veggie protein patties are the perfect option for lunches, dinner or snack time cravings. Next time you're in the mood for a delicious, satisfying vegan meal, simply cook these easy to make soy protein patties in the oven, in the microwave or on the grill. 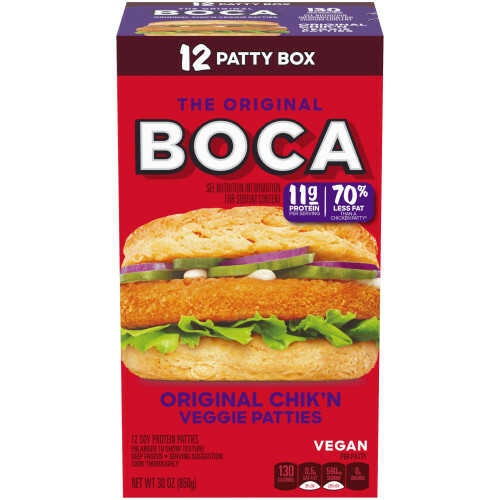 The 30 ounce box of BOCA Original Chik'n Vegan Patties contains four hearty patties that stay fresh in the freezer until you're ready to feast. WATER, WHEAT FLOUR, SOY PROTEIN CONCENTRATE, SOY PROTEIN ISOLATE, CORN OIL, CONTAINS LESS THAN 2% OF SALT, YEAST EXTRACT, YELLOW CORN FLOUR, WHEAT GLUTEN, METHYLCELLULOSE, SUGAR, HYDROLYZED CORN PROTEIN, YEAST, PAPRIKA EXTRACT (COLOR), SPICES, NATURAL FLAVOR (NON-MEAT, CONTAINS SOY), DRIED ONION, LEAVENING (SODIUM ALUMINUM PHOSPHATE, SODIUM BICARBONATE), DRIED GARLIC, SUCCINIC ACID, THIAMIN HYDROCHLORIDE (VITAMIN B1).